Special counsel Robert Mueller charged 13 Russians and three Russian companies on Friday with interfering in the 2016 election by assuming U.S. identities, sowing discord on social media, communicating with unwitting Americans and even setting up political rallies from afar. President Donald Trump tweeted that the indictment proves there was “no collusion!” with Russia. The White House repeated that point, sending out a statement with “NO COLLUSION” in all caps. The indictment alleges that starting in 2014, the Russian Internet Research Agency tried to disrupt the U.S. political system and sow discord by stealing U.S. identities and falsely claiming to be U.S. activists. 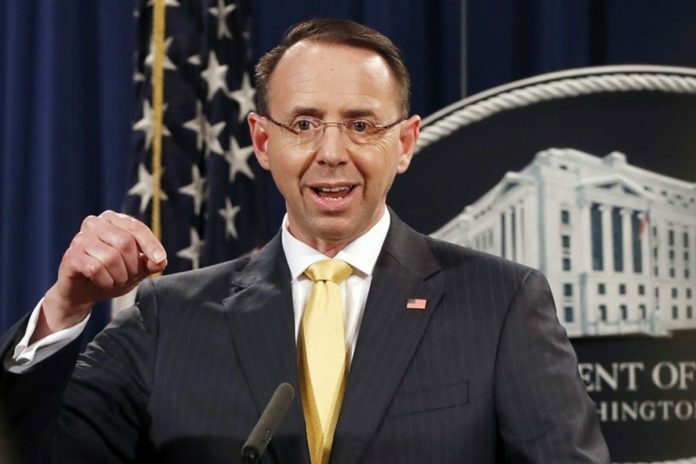 Specifically, the indictment charges the individuals with conspiring “to obstruct the lawful functions of the United States government through fraud and deceit,” by making illegal campaign expenditures, failing to register as foreign agents and using false statements to try and obtain visas. Some are also charged with wire fraud and identity theft. By early to mid-2016, the indictment says, their efforts included supporting President Donald Trump’s campaign and disparaging Democrat Hillary Clinton. The indictment says the Internet Research Agency was funded by Yevgeny Prigozhin, a St. Petersburg businessman dubbed “Putin’s chef” because his restaurants and catering businesses once hosted the Kremlin leader’s dinners with foreign dignitaries. It was also funded by companies he controlled, it alleges. Trump is right that there is no evidence of collusion in the indictment that was announced Friday. It doesn’t mention collusion at all. But that doesn’t mean the matter is settled, because Mueller’s investigation is continuing. Along with several congressional investigations, Mueller’s investigation began with the question of whether anyone on Trump’s campaign colluded with Russians who meddled in the 2016 campaign. The indictment released Friday doesn’t include any evidence that they did. Though some Democrats have opined that Russian interference could have swayed the results, there’s been no evidence that it did. In an assessment after the election, the U.S. intelligence community described a Russian government effort to interfere on Trump’s behalf. But they didn’t assert that it swayed the election. Who were the Russians helping? Most of the Russian election efforts detailed in the indictment are to help Trump’s campaign, though the document is carefully worded, saying that their operations “included” supporting Trump and disparaging Clinton. The indictment also alleges that the Russians tried to denigrate Sens. Ted Cruz and Marco Rubio, who ran against Trump in the GOP primary, and to support Sen. Bernie Sanders, who was running against Clinton in the Democratic primary. And according to one internal review, a specialist was criticized for having a low number of posts criticizing Clinton. The person was told “it is imperative to intensify criticizing Hillary Clinton” in future posts. After the election, the indictment alleges that the Russians organized rallies both in favor of and opposing Trump. The indictment alleges detailed, intricate plans to wage what the Russians called “information warfare” against the United States. Beyond detailed efforts to appear as Americans through emails and social media posts, and organizing real rallies, at least two of those charged actually traveled to the United States and visited several states, posing as political activists. They also paid Americans to carry out their objectives. Ahead of a Florida rally, the Russians asked one person to build a cage on a flatbed truck and another to wear a costume portraying Clinton in a prison uniform, according to the indictment.